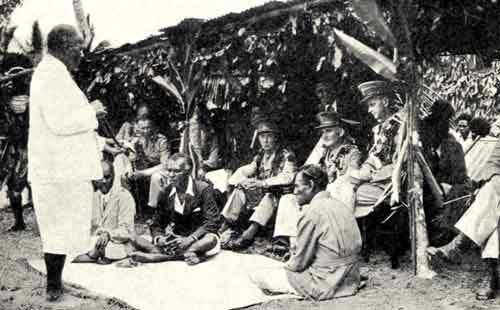 The chief of Vuci presents a tabua (whale’s tooth) to the commander of the 29th New Zealand Battalion. In the early stages of the Second World War, New Zealand soldiers were stationed in Fiji, which was an important staging post between combat zones in the Pacific. The New Zealand force was replaced by American troops in 1942. Reference: Pacific story: a survey of the early history of the Third New Zealand Division. Wellington: Army Board, 1945, p. 25.